Complete mint no hinge set. Otherwise very fine. TURKS- UND CAICOS-INSELN. 1873, 1 P. Brown rose, almost mint never hinged, superb. 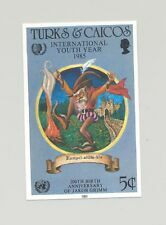 #674 Youth Year, UN, Grimm Fairy Tales 1v Imperf Proof, Denomination different than issued stamp. Issued 95¢. (d61)(d3964). Turks & Caicos Mint & NH. TURKS AND CAICOS ISLANDS King Edward VII 1909-11. From The Range SG 115 to SG 126. The Complete Definitive Set - Excluding SG 116 ¼d. Red. Add to Favourites. Catalogue Value £131 . Very Fine Used. Issued 25¢. (d61)(d3961). Turks & Caicos Mint & NH. Katalog-Nr. : 1637/51 I. Jahrgang: 2001. Scott 1168. Turks & Caicos Islands. I will send out invoices, unless you have already paid. Feel free to use checkout. (d61)(d3960). Turks & Caicos Mint & NH. J J AUDUBON. 1/13/4 2/6/1. to send you an invoice so that you may receive the proper. Good condition set of Turks & Caicos. WWII BATTLE OF BRITAIN LONDON CHILDREN TURKS & CAICOS ISLANDS. MINT NEVER HINGED SOUVENIR SHEET. 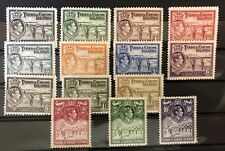 Turks & Caicos Islands, Scott# 1 - 9, complete mint set, bright and fresh, original gum, Hinged, Fine-VF. 2018 Scott value $150.85 US. #614-618 Correggio, Art, Religion, Easter 4v & 1v S/S Imperf Proofs Mounted on Cards, 4-6 exist (d35)(d2489). Turks & Caicos. Turks & Caicos Mint & NH. #878-882 Olympics, Baseball 4v & 1v S/S Imperf Proofs on Cards, 4-6 exist (d35)(d2493). (d52)(d3253). Caicos Mint & NH. #65-69 Youth Year, UN, Dove, Globe, Rainbows 4v & 1v S/S Imperf Proofs. (d52)(d3251). Caicos Mint & NH. Turks & Caicos. #682-683, 685-686 Bach, Composer, Music 4v Proofs on Black Construction paper. (d61)(d3945a). 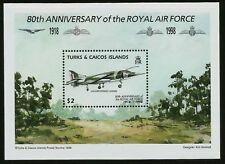 #70-73 ICAO, Aviation 3v & 1v S/S Imperf Proofs. (d52)(d3252). Caicos Mint & NH. 53,53a,56,57,58,59(no gum), 60,61,66,70,71,72. AS PER SCAN. Turks and Caicos Islands. mint fairly lightly hinged. 1987 New Jersey, Coat of Arms, Bicentennial of the US Constitution 1v M/S of 5 & Label Unissued Imperf Chromalin Essay, light stain top left - see photo (d20)(d1230). Turks & Caicos. Turks & Caicos. #756 Fish 1v S/S Imperf Proof Mounted on Card. (d61)(d3957). #675 Youth Year, UN, Mark Twain, Author, Grimm Brothers, Fairy Tales 1v S/S Imperf Proof. (d61)(d3965). Turks & Caicos Mint & NH. 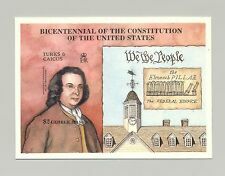 1987 John Adams, Bicentennial of the US Constitution 1v M/S of 5 & Label Unissued Imperf Chromalin Essay (d20)(d1227). Turks & Caicos. Flamingos, Birds, Coat of Arms 2v Revenue Imperf Proofs. (d61)(d3955). Turks & Caicos Mint & NH. (d61)(d3948). Turks & Caicos Mint & NH. COUNTRY : Turks & Caicos. CONDITION : Mint, Never Hinged. TURKS AND CAICOS ISLANDS Queen Elizabeth II 1978. The Complete 25th Anniversary of the Coronation Set. SG 494 to SG 497. Add to Favourites. MINT Never Hinged - Full Original Gum.